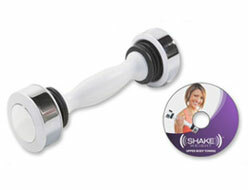 Order the Shake Weight now for just $19.95 plus shipping and handling. You’ll also receive a free Bonus Upper Body Toning Workout DVD. This offer is not available in stores. 4 Comments on "Shake Weight"
I would like to know the complete cost with shipping and is the free DVD offer just for a short time. I have had problems with my arms all my life. Mostle becuse of yo yo diets and now that I’m in my sixtys I can’t stand all the flab. Thank you. The shipping and handling cost is $7.95 throughout the entire US. I’m 72 years old. Can the Shake Weight help me?